The world > Berklee > Monk Institute > the world. I keep going back. Even on Fridays. Gospel meets the Met meets "uh huh". His masterful acoustic guitar takes over the air. Breathe. Beyond Cote d'Ivoire. Pan-African soul. Guitarist, composer, arranger. Second generation mastery. Bodacious. Liquid guitar, B3 and brass sophisticated funk, er, jazz. Photographers see things. We walk around with invisible brackets before our eyes, constantly framing most anything which falls within our view. We are consciously aware of patterns and lines defined by light and dark, color and texture, physical objects and negative space. We see things we want to capture. Things we want to show other people. John Szarkowski called it pointing. “One might compare the art of photography to the act of pointing,” Mr. Szarkowski wrote. “It must be true that some of us point to more interesting facts, events, circumstances, and configurations than others.” We aspire to be pointers. We strive to make our observations interesting. Mr. Szarkowski, curator, educator, author, photographer, passed away on Saturday. His contribution to the world of photography, to those who capture images and those who gaze upon them, is respectfully chronicled in Philip Gefter's column in The New York Times. He curated some 160 exhibits of photography while at New York MoMA, and exposed the world to visionary photographers like Diane Arbus, Garry Winogrand and Lee Friedlander. As Gefter says, he was "a curator who almost single-handedly elevated photography’s status in the last half-century to that of a fine art". Chris Rainier, a National Geographic staff photographer, told Alex Chadwick on NPR's occasional series Photo Op, Szarkowski, "maybe more than anyone else, created the notion that photographers are not merely technicians or observers -- they are artists." From the perspective of one photographer in Belltown, it seems John Szarkowski helped create a generation of people who are willing to look, think about, and respond to what photographers want so much to share. They are willing to see. I love that photograph of yours. "Eagle and Crow" is it? I have it framed on my "wall" in my study. I have a great deal to learn about appreciating photography but your conversations and posts (and images) have helped to "point" me toward seeing more... and therefore understanding more... and enjoying more. After all, it is about the enjoyment, no? At least sometimes? Maybe? Your photo (above) is remarkable in and of itself. But somehow knowing that the red peak is the tip of Calders monumental eagle in the sculpture park, and knowing that the bird is a crow, and knowing that the crow was resting on the steel and had only just taken flight (rather than flying by) and even knowing that standing where you stood one can hear the Puget Sound wave against the shore... well... it makes the image THAT MUCH MORE enjoyable. To me anyway. I did not know of John Szarkowski. But I know you. So maybe I did. Keep putting the images please. Thank you, Hank. It's gratifying to know one of my images is on one of your walls in Digitalistan, and that it stimulates your senses and calls to mind things not seen. We learn to stimulate the eye, but our hope is to stimulate the mind, memory, emotions. That was exactly Mr. Szarkowski's point. Photography is much more than a utilitarian medium. There more than one, brother. And you should see the oil painting. Coming along nicely. Bruce, thank you for the pointer to Szarkowski. The writing and the brilliantly distilled essence of a photograph could not illustrate "pointing" more clearly or eloquently. The photo is a figurative and literal "pointer". 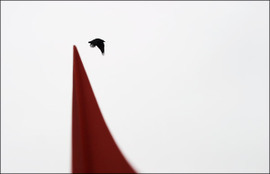 Calder's pointy red Eagle, the white background, soft focus, and fleeting transience of transitional crow are heavenly! It succeeds aesthetically and symbolically. I had never heard of Szarkowski before but I followed some of your links and Googled around. He was definitely a visionary thinker and communicator in the right place at the right time. His unique interests and ability to communicate linked a generation of pioneering photographers to a public that was ready for what they had to offer. It seems like Szarkowski was a galvanizing figure and without him we may never have become aware of the comtemplative, irreverant, slice-of-life, social commentary modes of Eggleston, Erwitt, Koudelka, Atget, Friedlander, Winogrand - wow! It's a real tribute to all of the photographers and to Szarkowski that their work is still as relevant, exciting and interesting now as it was "back then". I still think of their work as pioneeringly avant-garde and exciting, but I also think, "Of course". Thanks Mike. Mr. Szarkowski, relatively unknown to most of us, catalyzed a generational shift in our collective perception of photographic images. It is good to be reminded what one person can accomplish. I appreciate your comment. Always a pleasure to find you in the stream.